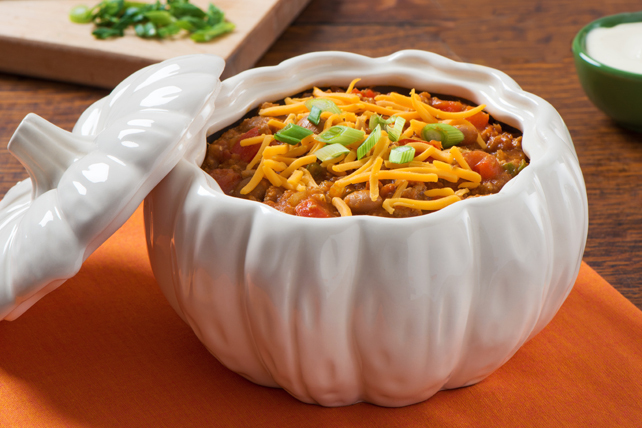 Ground turkey, vegetables and pumpkin come together in this spicy chili - the perfect way to warm up on a chilly evening. Heat oil in Dutch oven or large deep skillet on medium heat. Add turkey; cook 5 to 7 min. or until done, stirring occasionally. Add celery, yellow onions, red peppers, jalapeño peppers, garlic and seasonings; mix well. Cook 7 to 10 min. or until vegetables are softened, stirring occasionally. Stir in tomatoes, beans, broth, pumpkin, Worcestershire sauce and syrup; simmer on medium-low heat 1 hour or until thickened, stirring occasionally. Top with cheese and green onions. Serve drizzled with dressing. Prepare using Renée's Classic Ranch 1/2 Fat Dressing. Serve with lime wedges to squeeze over the individual bowls of chili.